Marine Aluminium (MA) is one of the world’s leading companies in the engineering, design and fabrication of aluminium structures and products for the offshore and shipbuilding industry. It has particular competence in the fields of material technology, extrusion tooling and welding techniques. The company was established in 1953 and is based in Norway and China, with more that 250 employees. It is DNV certified (ISO 9001, ISO 14001 and OHSAS 18001). Extensive knowledge and experience are decisive factors in MA’s ability to supply products of a consistent quality. Modern production facilities, highly skilled personnel and a network of partners ensure that results comply with all specifications and requirements. Aluminium helicopter decks offer substantial benefits over other materials. This makes them particularly suited to marine, offshore and other weight-sensitive structures. 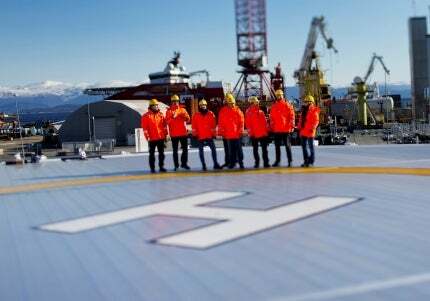 MA is the world’s leading producer of aluminium helicopter decks. The company’s decks come in standard type or can be tailor made to fulfil the customer’s requirements. Delivery options range from a package for container transport to a completely installed turnkey helicopter deck, including lighting, firefighting and more. With more than 500 decks installed since 1974, MA customers include DONG, BP, Modec, Statoil, Petrobras, Aker, Vulcano, Samsung, Kleven and many other shipyards. The alloy used for MA helidecks has the same mechanical properties as mild steel and merely one-third of its weight. In addition, the extrusion technology provides the designers with possibilities that are impossible with steel. The aluminium alloy used also requires less maintenance due to its corrosion resistance. MA telescopic gangways can be used to bridge fixed and floating installations and are widely used for personnel access between offshore installations. The telescopic bridge ensures the safety of personnel even during the roughest conditions, as the bridges can be fitted with motion compensation and automatic disconnection in the event of an emergency. The gangway can also support transfer lines for fuel, mud, electricity, water, and more. Customers include Prosafe, Odfjell Drilling, Statoil, Haliburton, Sedco Forex and Seatruck. MA can supply a wide range of custom-built offshore modules complete with design, engineering and production services. The modules can be used for various purposes, including office space, recreational areas, workshops, containers, storage, control rooms, helicopter hangars, ROV hangars and LER/LIR. Customers include Statoil, Aker Solutions, Stena Drilling, Shell and Aibel. All modules can be supplied ready outfitted and insulated to any fire rating. Low weight makes installation easier by reducing the amount of work required offshore. The modules can be fully outfitted and still be lifted using existing cranes on the installation. This unique process makes it possible to weld extruded aluminium profiles through friction heating without the need for either shielding gas or filler metal. The lower heat required for welding the profiles means less distortion, and the technology produces panels with better mechanical properties than fusion welding. MA has developed a site-built railing system based on its former SAR system. Site-built railing systems offer minimum weight, easy installation and easy modification. MA’s system can be installed offshore without any hotwork. It is highly versatile and can be adapted to any structure. FlexiBarrier has been developed to cope with the rough handling of goods and containers offshore. It consists of hinged and energy absorbing posts and horizontal railing with flexible interconnection. The system’s unique design, low weight and high corrosion resistance offer great advantages over comparable steel constructions. FlexiBarrier is delivered with footplates for either welding or bolting to steel or aluminium decks, and the railing can be supplied in different heights and with an optional number of rails. It can also be extended to a larger flexi-wall structure. MA after-sales and service is professional and competitive in all areas for marine aluminium products. The company provides service specialists for the operation, inspection and maintenance of its products as well as design, modification, engineering and management of onshore and offshore projects. MA’s total maintenance management (TMM) programme consists of defined and bundled services on different levels within different service-scopes. TMM handles both preventive and corrective maintenance, as well as management of spare parts and service personnel. The MA Academy is a programme for training and certifying gangway operators. MA is an original equipment manufacturer (OEM) for the MA-gangway product. The MA Academy Certificate consists of theory about technical management and a desktop simulator and full-size simulator. A final examination accredited by members of the MA Academy board will qualify personnel for OEM compliance. A contract has been awarded to Marine Aluminium (MA) to build a telescopic gangway for Edda Accommodation, which is owned by Østensjø shipping.